Melody Vallieu | Miami Valley Today Lori Ludwig, MSR, RN, CNE, director of the nursing program at Upper Valley Career Center’s Adult Division, speaks to seniors at UVCC about the practical nursing program and how “Baby Luke,” a computerized doll, is used to teach nursing students labor and delivery skills. Melody Vallieu | Miami Valley Today Tyler Siegel of Fort Loramie takes Sidney High School student Adreanna Murphy up in the 60-foot bucket truck donated by the city of Piqua for use in the Electrical Power Line Mechanic program at Upper Valley Career Center’s Adult Division. Melody Vallieu | Miami Valley Today Taylor Coleman of Troy, a senior student at Upper Valley Career Center, climbs an electrical pole during a career day event at the center’s Adult Division. After climbing, Coleman, who said he already was interested in the Electrical Power Line Mechanic program, said he will be applying for the next classes to begin in August. The annual event reaches out to seniors in area schools that still may not have plans following graduation, according to Roberta Jacobs, media and program specialist. “Some of these students are graduating in a month and still don’t know what they want, or will do with their futures,” Jacobs said. Programs from the UVCC Adult Division that were highlighted at the event include Precision Tooling and Machining, Advanced Manufacturing Maintenance, HVAC and Refrigeration, practical nursing (LPN) and Electrical Power Line Mechanic. Students from Sidney High School and Upper Valley Career Center attended the event, according to director Scott Naill. Students were identified by the schools and Adult Division employees to specifically attend the event to introduce them to what the Adult Divison could offer them after graduation, Naill said. Financial aid information for the programs also was available to students, Jacobs said. Adreanna Murphy from Sidney High School, a junior graduating early, came to the event to look at the different programs offered. 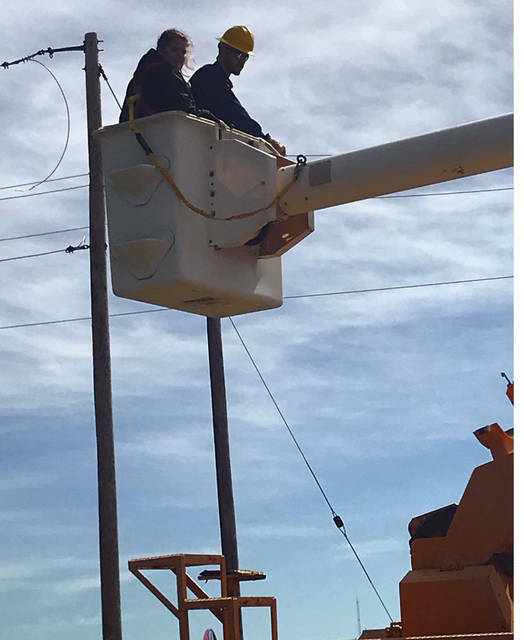 She took a ride in the 60-foot bucket truck from the Electrical Power Line Mechanic program. She said she had multiple reasons for going up in the truck. Bill Liddy, a retired city of Piqua employee now a teacher with the Electrical Power Line Mechanic program, said the program has been offered since 2015 and is an extension of the program based at the Warren County Career Center. The nine-month, 900-hour program is offered once a year and will begin a new class in August, Liddy said. He said an average of 10-12 students go through the program annually at the Piqua location. Taylor Coleman of Troy, a UVCC senior, said he was looking at either maintenance or the Electrical Power Line Mechanic program as a career. However, after climbing the electrical pole at the career event, it sealed the deal for the Electrical Power Line Mechanic program. The school also is working toward developing an RN program to add to their already successful LPN program, according to Nursing Program Director Lori Ludwig, MSR, RN, CNE. She said the program is probably 10-12 months from fruition, and will be a diploma program offered once a year. Following that, Ludwig said they also are working with Muskingham University to offer a RN to BSN pathway into the future for those wishing to continue their education. “The only limit is what you put on yourself,” Ludwig said. 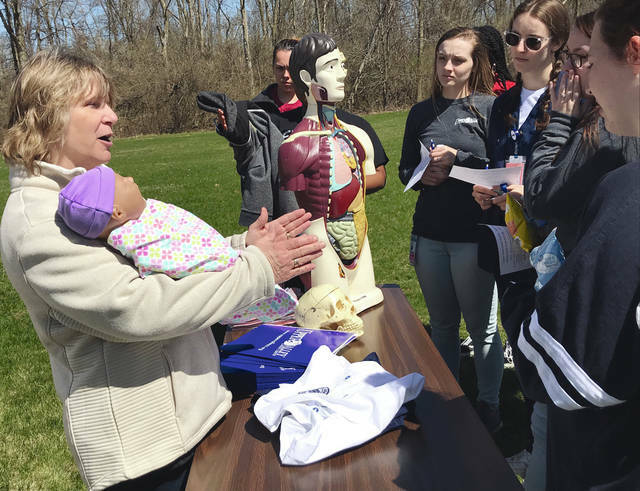 https://www.tdn-net.com/wp-content/uploads/sites/21/2019/04/web1_nurse.jpgMelody Vallieu | Miami Valley Today Lori Ludwig, MSR, RN, CNE, director of the nursing program at Upper Valley Career Center’s Adult Division, speaks to seniors at UVCC about the practical nursing program and how “Baby Luke,” a computerized doll, is used to teach nursing students labor and delivery skills. https://www.tdn-net.com/wp-content/uploads/sites/21/2019/04/web1_Truck.jpgMelody Vallieu | Miami Valley Today Tyler Siegel of Fort Loramie takes Sidney High School student Adreanna Murphy up in the 60-foot bucket truck donated by the city of Piqua for use in the Electrical Power Line Mechanic program at Upper Valley Career Center’s Adult Division. 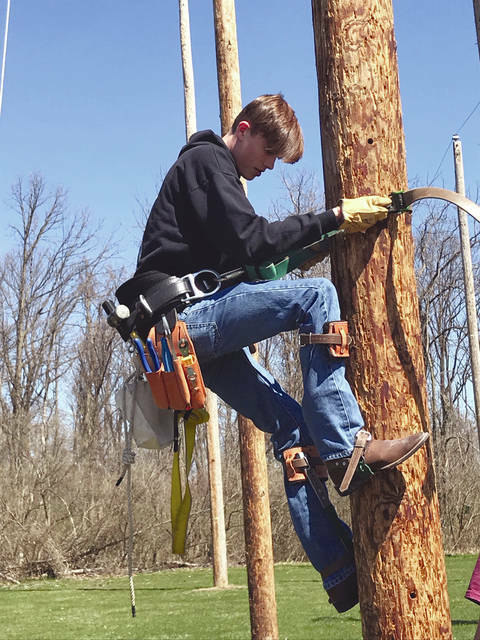 https://www.tdn-net.com/wp-content/uploads/sites/21/2019/04/web1_Line.jpgMelody Vallieu | Miami Valley Today Taylor Coleman of Troy, a senior student at Upper Valley Career Center, climbs an electrical pole during a career day event at the center’s Adult Division. After climbing, Coleman, who said he already was interested in the Electrical Power Line Mechanic program, said he will be applying for the next classes to begin in August.